Meet Chad Brown, one of nearly 380 000 military personnel who have asked the Veterans Affairs for help to deal with Post Traumatic Stress Disorder (PTSD). Chad was in the desert wars of Desert Storm and Desert Shield, served at Guantanamo Bay and fought in Somalia. He was a man who lost his way – and then found it again in fly fishing. And then decided that he in turn could make a positive contribution to society – using fly fishing. Try this short excerpt, and if you like it, read the rest of the (long) article. So an Irish American, a Mexican American, an African American, an Asian American, and an Irish-Ukranian-Filipino American walk into a bar. Actually, it’s a breakfast bar. It’s zero dark thirty on a cold January morning, and we’re at a tiny café in Oregon’s Willamette Valley. After some coffee, we are going to chase winter steelhead. Let’s deal with the fish right away. About 20 inches long, sometimes much more, steelhead are named for their dull silver, bullet-shaped heads, but depending on their life stage and the time of year, they can be silver-bright from the ocean or passionately colored like mutant rainbow trout. Big and strong, they have the habits of salmon, like going to sea and then, upon their return, refusing to bite a fisherman’s hook. They’re so hard to catch that they’re known as gray ghosts. Steelhead are the real reason for this gathering, but Chad is the excuse. He’s a U.S. Navy veteran who participated in Desert Storm and Desert Shield, served at Guantánamo Bay, and saw combat during Operation Restore Hope, in Somalia, during the infamous Black Hawk Down era. That formula has produced Soul River, a left-right punch of fly-fishing lifestyle brand and do-gooder project that Chad founded in 2013. The boutique is also home to Soul River Runs Wild, the 501(c)(3) nonprofit through which Chad runs educational trips to help at-risk kids connect with the outdoors. His irresistible twist is to tap fellow veterans to mentor his students. Meanwhile, he’d like to catch a steelhead himself. Just once. Recognizing that he was a veritable checklist of qualities it was seeking to promote—educator of children, veteran, entrepreneur, advocate for greater access to the nation’s wilderness areas—the U.S. Fish and Wildlife Service partnered with him to fund more trips. 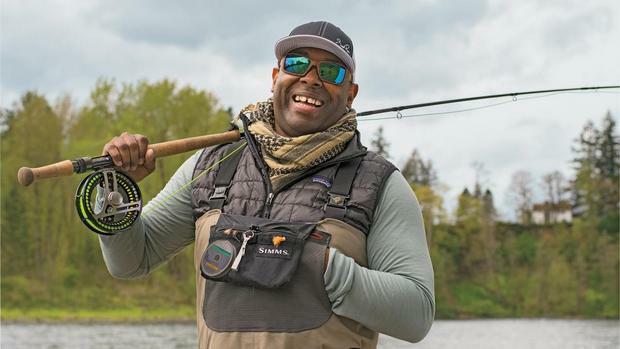 The agency brought him to Washington to speak on Capitol Hill, where he urged members of Congress to fund the Urban Wildlife Refuge program, and is arranging for him to fly at-risk kids up to Alaska to fish with young Native American leaders. After a September 2014 speech to leaders of the National Wildlife Refuge Association, he was invited to join their board. Ever Cast to a Queue of Salmon? Do You Have Catch & Release Know-How? Fancy a Featherweight Rod with a Heavyweight Punch? Want To Cast That Fly a Little Further? © 2019 Hooked On Fly Fishing.